This past weekend I competed in my sixth St. Anthony’s triathlon with the goal of defending my title and having a strong race. I had won the St. Anthony’s Triathlon the past three years, so I was hoping to continue on with a fourth victory. 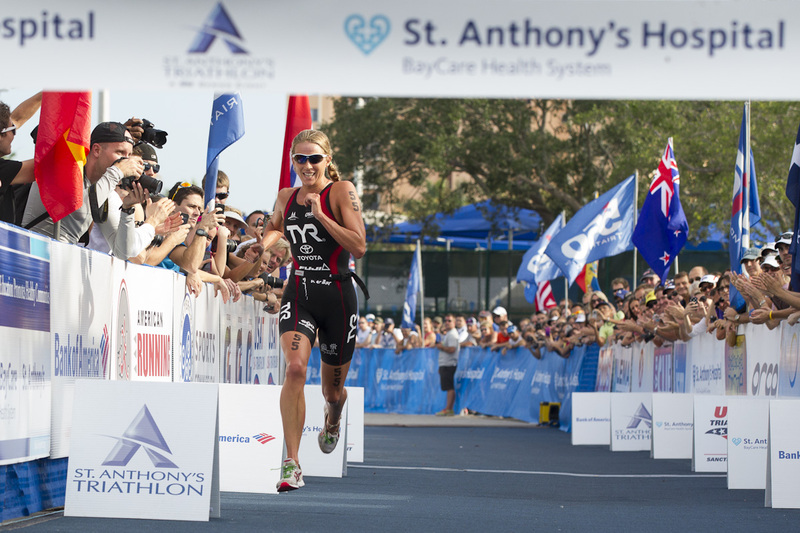 St. Anthony’s is one of my all time favorite triathlons. I love the city, venue, and the overall race atmosphere. St. Anthony’s is one of the oldest triathlons in the country as this year it celebrated it’s 29th anniversary. Last year, my Dad and brother were in town cheering me on and were inspired to race this year. Both of them had Olympic distance PR’s and definitely have the triathlon “bug”. I have had a blast coaching them and seeing them fall in love with the sport I am so passionate about. St. A’s is filled many veterans and newbies, but everyone there always has a smile on their face enjoying the post race party, food and no matter their performance that day; happy to cross that finish line. I was pretty nervous the days leading up to St. A’s as I knew the field was stronger than ever on both the men’s and women’s side. Training has been going really well in Florida, but you just never know what challenges are going to lie ahead on race day. Anything can happen on race day and these are the challenges that go far and above any training day. The swim was at a different location this year. 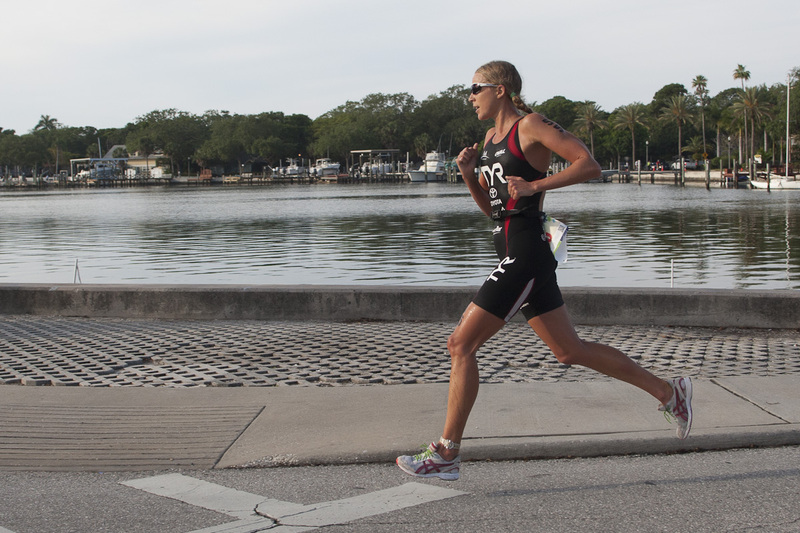 It included a deep water start, but the finish was still at the same location, up a set of steps leading into the transition in Vinoy Park. 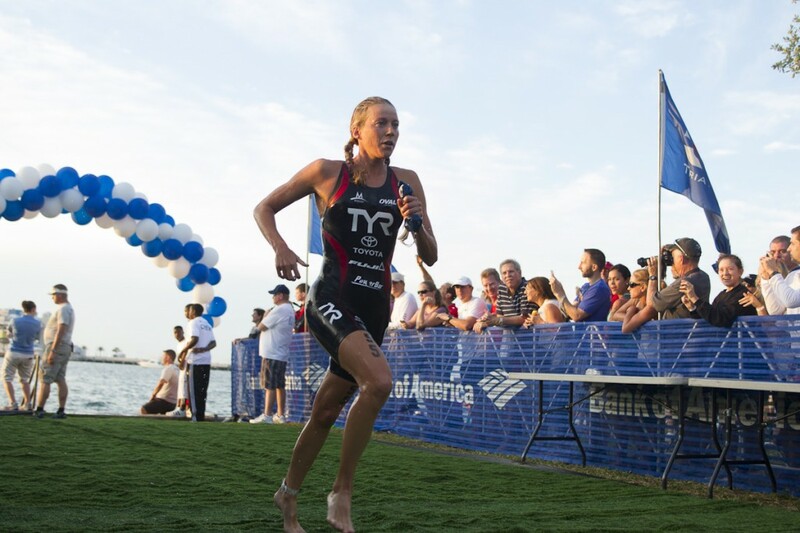 One of the toughest parts of the race this year was the swim start! With the deep water start, it was tough to break out of the mass of swimmers. I remained calm and looked for clear water. Over to my left hand side, I spotted clear water and Sara McLarty just ahead. I pushed the pace for 100 meters to bridge the gap up to Sara and then did my best to keep up with triathlon’s best swimmer. The second half of the swim got pretty rough, which I feel I thrive in the chop, and was able to stay five seconds behind Sara throughout the swim. 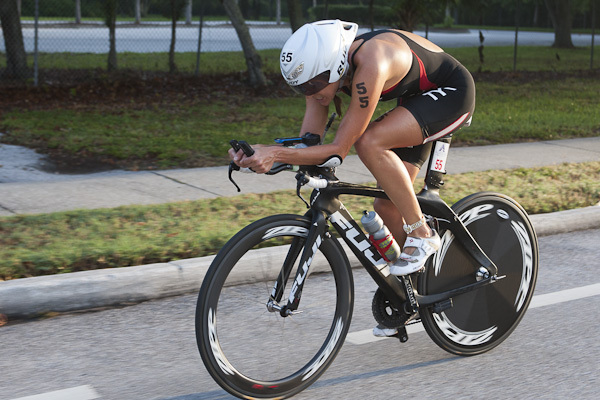 I knew smooth and fast transitions were going to be key today, but key for any race. I had a descent T1 and pushed the first five miles of the bike. The middle ten miles of the bike, I settled into a tempo pace. At mile 15, Alicia Kaye and two pro men came by me. This was awesome to have people push me to keep me pressing on the cranks. Throughout the remaining ten miles of the ride, I remained about fifteen seconds behind the three riders and rode hard into the transition area. Here is my Quarq Cinqo Power file on Trainingpeaks.com. Once out onto the run, I knew there were many fast runners behind me. I pushed the first mile and the settled the pace down as I got into the run. I was feeling the humidity and a bit of fatigue, but heading into the last mile, spectators were cheering me on, telling me to push hard to break the course record. I wasn’t thinking about the course record at all until this point in the run, but I had an extra surge of energy the last 500meters as I got close to that finish line. I was so happy to accomplish my goal of a 4-peat! In addition, I was thrilled to beat the course record by 50 seconds in a 1:56:55 and having a 54 second course PR. The previous record was set by Michelle Dillion back in 2007 and I clearly remember that day, sprinting with her to the finish line. She is an amazing athlete and it was special to have her cheering me on out on the course. Now I am focusing on recovering and getting ready for the race I have been preparing for all season, Olympic Trials on May 11th. Thank you to all my fans, supporters, and sponsors for being there with my every step of the way.